Heat oven to 450°F. Butterfly the tenderloin until it is laid out flat. Place the butterflied tenderloin between large pieces of plastic wrap. With a meat tenderizer,pound tenderloin until 1/4-inch thickness. Season the tenderloin on both sides with salt and pepper. Place the chorizo down the center of the tenderloin, patting it down, and leaving about 2 inches on all sides of the chorizo. Roll up the tenderloin. Truss the tenderloin with kitchen string. Heat a large sauté pan to high heat. Pour in the oil. Place the trussed tenderloin in the hot oil. Sear the tenderloin on all sides evenly, until the bottom has a browned crust. Slide the skillet into the hot oven. Bake for 12-16 minutes or until an internal temperature of 160°F has been achieved. Remove trussing; slice the tenderloin on a bias. Place the pieces on a platter. 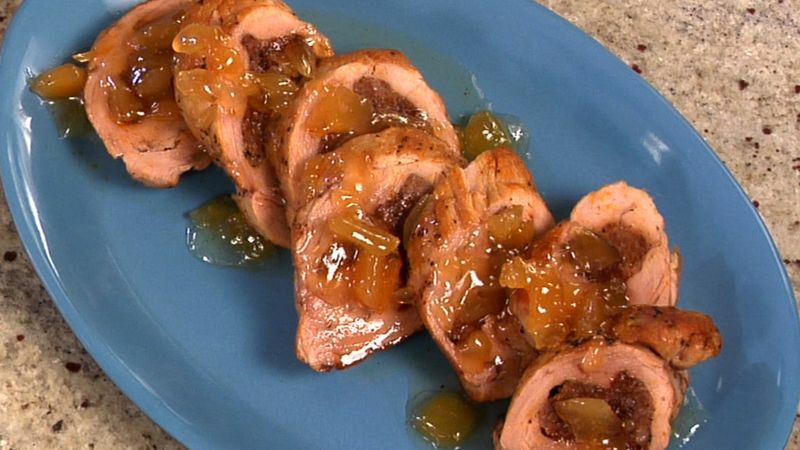 Drizzle the tenderloin with marmalade. Serve immediately.